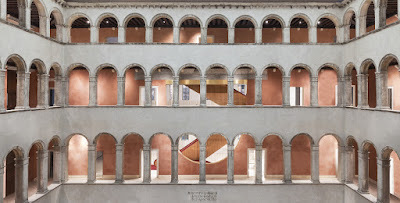 The first building and first renovation in our Progress Chic collection, the Fondaco dei Tedeschi in Venice, Italy is a brilliant example of what progress chic embodies. The buildings origins date back to 1228 but it has been 'updated' for centuries resulting in a grand story of beauty and functionality. The most recent remodel by Rotterdam-based architecture firm Office of Metropolitan Architecture (OMA) has one-upped all other modernizations by far. The building achieved monument status in 1987 and was bought by Benetton in 2008 and now stands as essentially a department store that exist within and celebrates great art and design.